The presenter has a brilliant Austrian accent, so that’s a thing. Apparently, it is very common for companies to disable O365 Groups before a full O365 deployment??? She highly recommends a governance and naming policy for O365 Groups. One way to enforce these is to create a workflow that requires someone to “OK” the group creation/name. 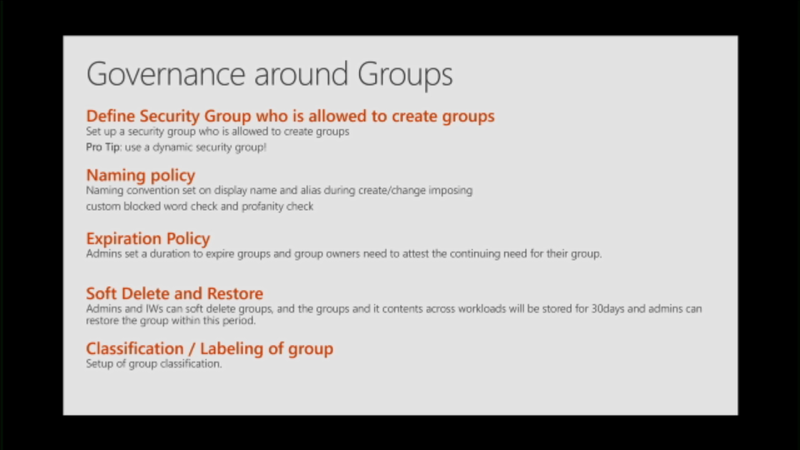 A lot of this is done via PowerShell (restricting who can create groups). The concept is to create an AD group of users who can create O365 Groups. Again, a lot of this is done via PoweShell scripting. So conceptually these are great ideas, but in practice, we’d have to track down some of the PowerShell scripts.